This morning I went for a bicycle ride, enjoying the breezy weather and using the opportunity to see what’s changing in Wattana, the larger district in which Tawn and I live. 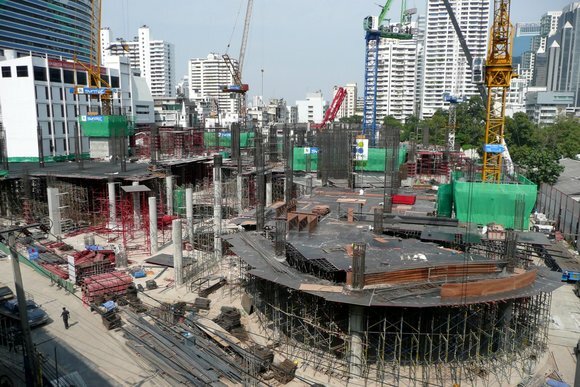 This area, with its large expat and middle-class Thai population, is forever changing. In what used to be the outskirts of town forty years ago, well-off Thai families built their weekend homes here along the canals and fruit orchards. The canals and orchards have long since passed with condos, restaurants and spas taking the place of the 1960s style modern Thai family homes. One of these homes, located in the property to the north of our condo, has just been torn down. The condo’s management has checked with the district office to see what is planned for the property but no plans have been submitted yet. 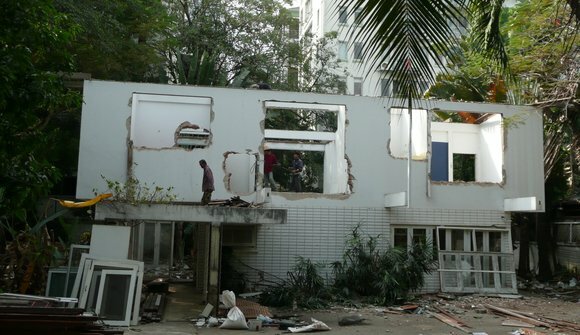 Interestingly, most of the demolition was done by a team of a half-dozen laborers. It was only shortly after the point shown above that a machine was brought in to tear down the final walls. The result, weeks and weeks the sound of breaking glass, cracking concrete and tearing wood. Made it a bit hard to record audio for some training programs I was working on. 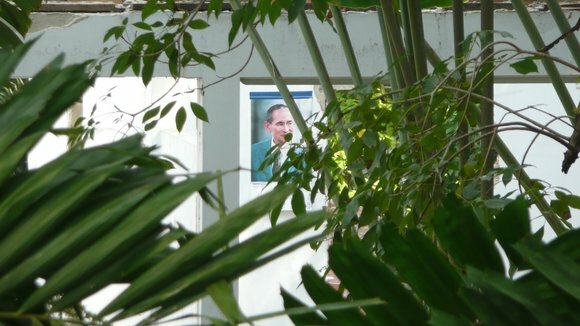 Something I noticed from our side of the property was that a poster of His Majesty the King, something that pretty much all Thais put on a wall in their house or place of business, was still attached to the wall even as demolition commenced. Is that kosher to do? 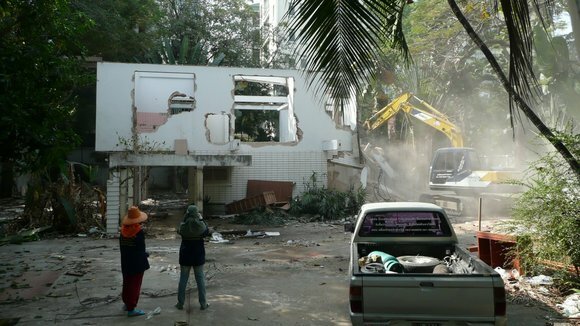 At the end of our soi (the small alleys that branch off the main roads) another large property has been cleared and construction fencing erected. According to the sign posted on the front of it, a seven-floor condo is being built there. More neighbors. Riding through the Wattana neighborhood, I spotted several interesting things. On Sukhumvit Soi 33, which is in an entertainment area geared largely for the Japanese community, I noticed this massage parlor. Based on the various massage services offered (“Lady of the Night Massage”?) I would assume that it isn’t the most legitimate place to find practitioners of traditional therapeutic Thai massage. My riding took me up along the train tracks that run parallel to Petchaburi Road. 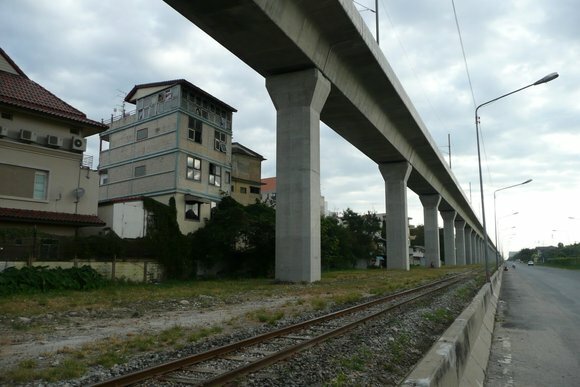 For four years now the Airport Express (“red line”) elevated rail line has been under construction. Bear in mind that the airport itself opened three years ago. Word is that it will be running either in April or August of next year. As most of the physical construction is complete, the frontage roads that parallel the tracks of the traditional railroad (the red line being built above the right-of-way for the regular train) has been rebuilt after having been shut down during construction. There is a lot of housing built adjacent to the train tracks. I’m sorry for the people who live there; I’m sure the noise of construction was terrible and the noise of the trains not much better. I was able to follow the train tracks about 8 kms to the east of my house to the Hua Mark station (just shy of halfway to the airport) before the paved road runs out. I then turned around and pedaled back, overshooting my house and going to the main in-city Makkasan station, located at Asoke Road. 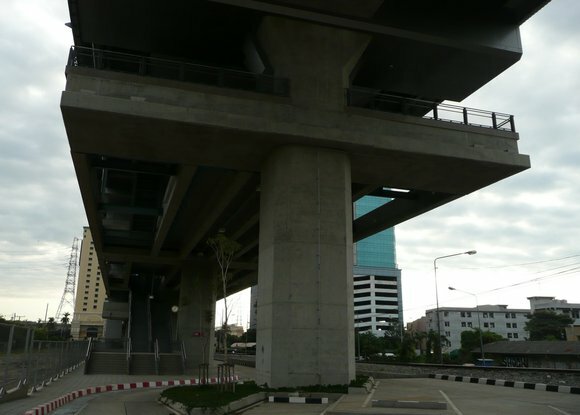 This is the Ramhamhaeng station located at Sukhumvit Soi 71. Oddly, there are a dozen parking spaces under the station, wholly inadequate for any actual parking needs. Also interesting: at all of the stations there are escalators that will run only in the up direction. The tracks are four to five stories above ground but passengers will have to descend manually. When I made it to the main Makkasan station, I pedaled into the construction gate and asked the guard if I could ride around. Not surprisingly, he didn’t think that would be a good idea despite the fact that the roads are all paved and perfectly safe to ride on. Some other sights: the Terminal 21 building, about which I wrote a few weeks ago, is making quick progress now that all the foundation and underground work is done. I’ve started shooting weekly pictures of the progress so that in the end I have a record of this building, which is rising at the corner of Sukhumvit and Asoke Roads. Anyone need another nine-story mall, cinema, office building and service apartment? Good, you’ll be glad to know a new one is being built for you. Passing another construction project on Ekkamai Road, I was tickled that the contractor made an effort to put the sign in English. Normally I have to practice reading Thai but this one was very clear. The project is to “make new restaurant.” Now, we’re not going to tell you what restaurant it is. That’s a secret. This entry was posted in Uncategorized and tagged Airport Express, Construction, Development, train, urban planning by christao408. Bookmark the permalink. LOL. “Make new restaurant” is so funny! It feels like an order you would perhaps give to a genie. Great pictures!! I love exploring new places, especially the buildings and houses where the locals live. 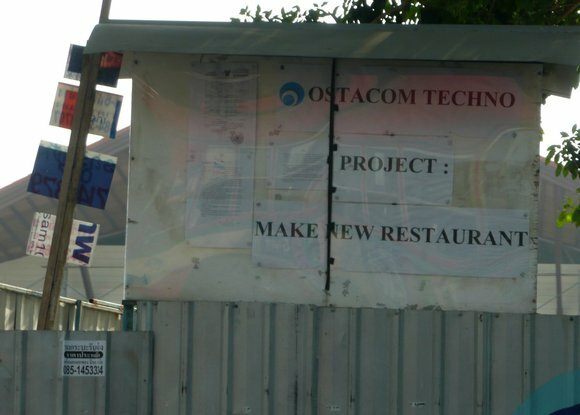 And I got a good laugh over that last one too: haha..project: make new restaurant. This looks like a really nice adventure! It’s really neat to see how you can find something interesting everywhere you go. Is it common to have just the ascending escalators?The secret is like a mystery box! I guess there’s more construction in your neighbourhood soon? I hope it’s not going to be another condo / office tower. Nice pictures.I think homes built back in the 1950s and 1960s are pretty vulnerable to new development. I’ve seen it in Bogota, Panama and Mexico City. The plots of land of those homes are usually well located and larger than average but the construction is no longer attractive to new families. Say in Bogota and Panama a lot of those homes were single floor homes in nice neighborhoods (not the “top” ones but still very desirable places). In Mexico City the preferred neighborhoods for redevelopment are usually older upper middle class or middle class areas which are central and which gradually decayed over time. Just a little more concise than “PROJECT: PUT BUILDING HERE” haha.Yes, it’s very odd that there are only escalators going up; though I seem to recall that there were places along the BART line that did that too… speaking of noise by the tracks, I used to live, for about 6 months, about 30 feet away from a BART track. That was not pleasant. I will never live anywhere near something like that ever again. I’m so glad to hear that they’re making a new, super secret restaurant. Can you imagine all the dust from so much construction?? At least you get some good Thai food at the new restaurants!! @christao408 – Yeah that’s the only reason I can think of. Gotcha.